Happy Hump Day! Wednesday means it's time for sponsor spotlight at Lollipop Crafts. This week our wonderful sponsor is Karber Stamps! Stop by the LC blog to get the scoop, and how you can win some cute digis! and she's ready bring a smile to anyone feeling blue. I followed a great sketch from the Sweet Stop, used one piece of dp from DCWV Mat Stack, and added some flowers and gems... even one in her hair! Please stop by the LC blog to see what my fellow teamies made. There's still time to play along our current challenge! I love "Gift Millie", she look adorable. 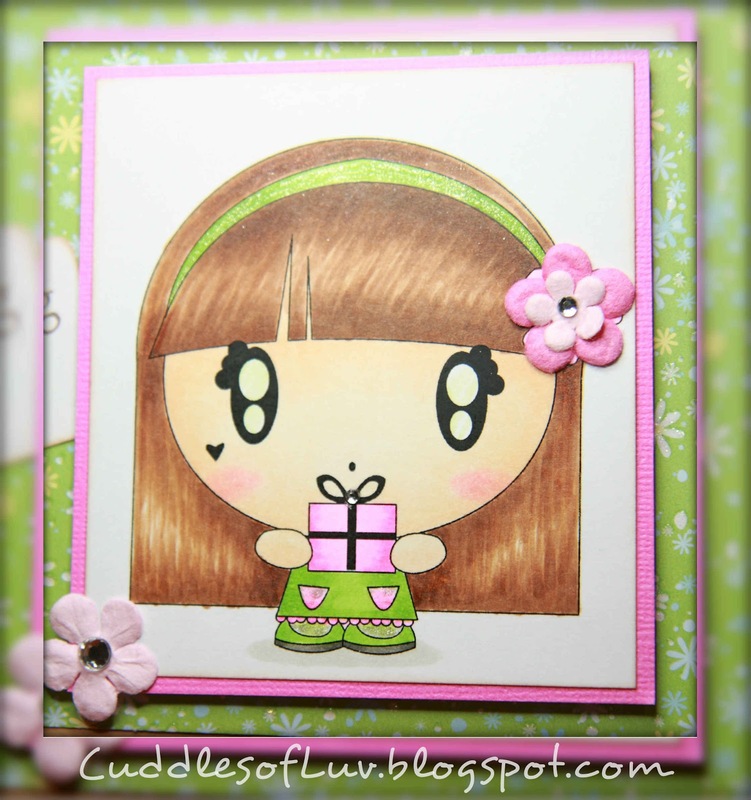 I really like the green-pink color combo... Fabby creation! She's so sweet! What a cute card! Love her!! How can you resist those big eyes! Love ur coloring and the colors are fantastic! this is one sketch that i would love to use too. Gorgeous work my friend! FUN! I love your coloring! This is so ADORABLE! Thank you for joining us in the Sweet Stop Sketch! Have a wonderful week, we hope you will join us again! Awesome coloring! She's adorable and great colors! Time for a little SPLASH!